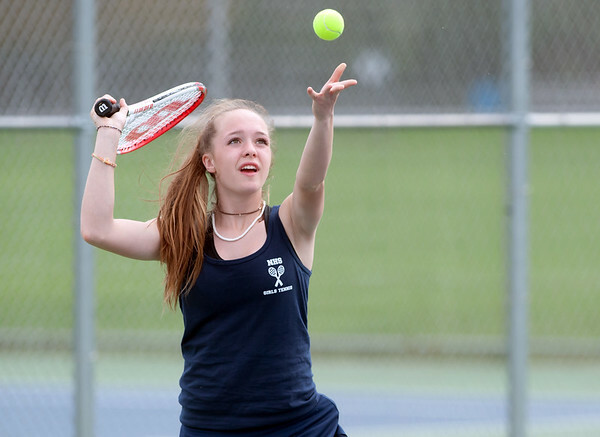 NEWINGTON - If the Newington girls tennis team wanted to start its season with a win, the start to its first match made it seem like a tall order. The Indians dropped their first two singles matches in their season opener, and faced an immediate hole against East Catholic, but Newington righted the ship and won every match the rest of the way to beat the Eagles 5-2 on Thursday. Mara Klin won the third singles match to start the streak for Newington, which claimed all three doubles matches, including a convincing win by the second doubles team of Kelly Iskra and Samantha Miller, who won 6-1 and 6-0. Southington 7, Plainville 0: The Blue Knights were all over the Blue Devils on Thursday, claiming every set while recording 6-0 set scores 10 different times as a group. Abby Murphy set the tone with a 6-0, 6-0 win over Joelle Stublarec in first singles, while the first doubles team of Kate Hardy and Isa Miani took down Sarah Tomczyk and Kimmy Xaques by the same score. Tolland 7, New Britain 0: The Hurricanes were shut out by Tolland on Thursday, but head coach Joe Vaverchak was impressed by Jose Garcia, who competed in his first high school singles match. South Windsor 5, Newington 2: South Windsor took three of four singles matches from the Indians to hand Newington its first loss of the season on Thursday. Matt Utter claimed the lone singles victory for the Indians, while the third doubles team of Marc Pantano and Grant Garcia earned a win over Jonathan Huot and Andrew Kotait. “I was very impressed with the team as a whole against a very good South Windsor team,” Newington head coach Don Lukowski said. Coginchaug 163, Berlin 167: It was a tough ending to the day for the Redcoats at Timberlin Golf Course. Cognichaug’s Tyler Woodward was the medalist of the match after shooting a 36, but the top four scorers for Berlin weren’t far behind. Matt Czerepuszko and Paul Calafiore both shot a 40, while John Downes shot a 43 and Jacob Lindsay finished with a 44. Wilcox Tech 213, Goodwin Tech 303: Ryan Pellegrino shined for Wilcox Tech on Thursday as Goodwin Tech fell to the Indians in Thursday’s match. Julien Stepien led the Gladiators with a score of 74, while Xavier Irizarry followed close behind with a 75. Posted in New Britain Herald, Berlin, Goodwin Tech, New Britain, Newington, Plainville, Southington on Thursday, 4 April 2019 21:24. Updated: Thursday, 4 April 2019 21:26.